Spindles, also referred to as balusters, are available in nearly unlimited constructs and are typically made from wrought iron or wood. 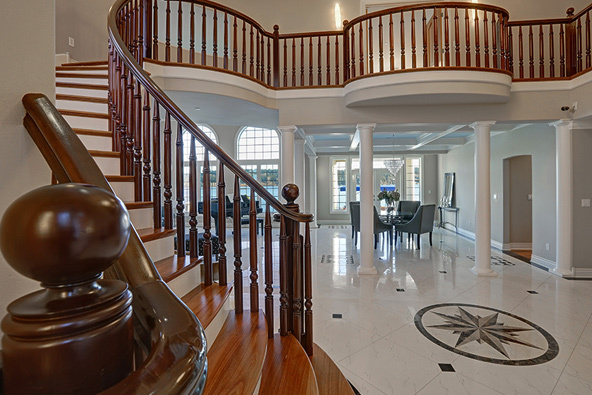 While the case and handrail typically receive most attention, we find it equally important to spend time selecting a spindle design for your stairway. In case you are unfamiliar, the spindle is the vertical component which supports the handrail, typically set in pairs per each case. Beyond supporting the handrail, spindles are equally important for protecting from falls and keeping children and the elderly safe. Most municipal building codes require fall protection of some sort. The most important consideration you will need to make is whether you prefer iron or wood. Most homeowners select wooden spindles for the value and durability they offer. Iron Balusters are both heavier and stronger than their wooden counterparts; however, they are also more expensive. Homeowners seeking an elegant staircase can select fully or partially twisted wrought iron balusters in satin black. The aesthetic created by traditional iron balusters Our favorite iron designs include a single gothic twist at mid-height. The ornate appeal of wrought iron spindles compliment both classical and modern homes. We are pleased to offer products from L.J. Smith Stair Systems, the premier staircase component manufacturer. Their in-depth and interactive staircase designer is useful for exploring the various spindle styles. The team at ASA Builders Supply is happy to assist you in selecting the perfect staircase components for your build. Reach us directly at 248-624-7400.